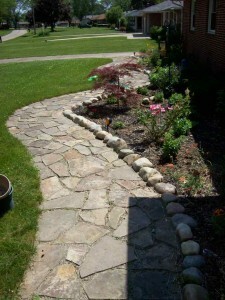 Of all the landscaping companies in North Canton Ohio, we like to think that BHW Landscaping sticks out. We believe this, and our satisfied clients would agree, because we always use the greatest standards of professionalism and quality of materials in our work for you. This means that, weather permitting, we always get our work doing as fast a possible, while ensuring that we maintain the highest standard of workmanship and the best ingredients in all of our jobs. If you order granite pavers for your sidewalk from your back patio through your garden, we would not skimp, and would order sealed granite tiles and retreat them for moisture and sealants. These small extra steps are things we do to ensure that your experience with our company, and the pleasure that you receive upon completion of a contract bring an elated smile to your face. While there are other companies who do similar things for their clients, we are sure that there are no better technicians and artists who will do the landscaping you require. Use the people who actually love the work they do and call BHW Landscaping today.